What a day! I don't know why this Saturday was so busy; there were only 3 weddings but it sure kept me going. I'm just happy my husband came along to help me with moving the harp. The morning started off quite early at Cecil Greens, and it was only my second wedding at that venue this summer. 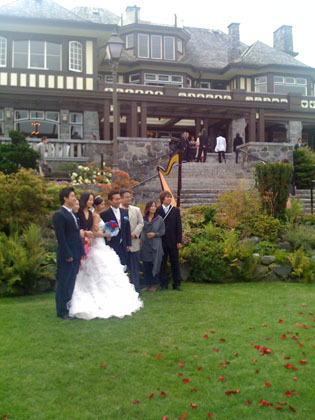 There's no denying that Cecil Greens at UBC is one of the most gorgeous venues in Vancouver - if you manage to book it. J&T were such a sweet couple when I met them for the consultation and they were both really beautiful - should have been in a magazine. I was situated at the first level above the grass, which made for a pretty picture. 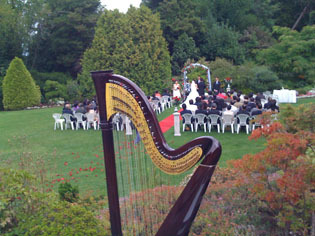 I was pleased to hear that the music traveled through the lawn quite nicely and everyone heard the music they choose. During the ceremony I snuck in a few pictures from my iPhone (see below). The rest of the day was sunny and gorgeous. As I left the last wedding at Queen Elizabeth Pavilion, Rev. Kevan Dobsin and his wife Wanda were taking pictures with a large wedding party of about 140 people or so. They were all posed by the fountain as I rolled on by with my harp and Rev. Dobsin shouted out, "Everyone, Say 'Bye Josephine!" and all 140 people said "Bye Josephine!" I couldn't have ordered a better way to finish a wedding day.